Walmart’s fourth quarter sales in the US rose slightly for the sixth consecutive time. 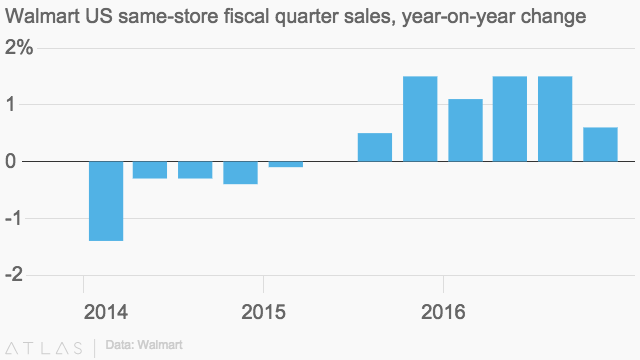 Walmart’s same-store sales in the US ticked up in the fourth quarter from a year earlier, marking the sixth consecutive quarter the world’s largest retailer has posted a year-over-year gain by that measure in its home market. The 0.6% same-store increase—though short of analyst expectations of 1%—was important because it illustrates how the company has sustained at least a little growth following a period of sales contractions. On Thursday (Feb. 18), Walmart reported that sales at all US stores clocked in at $81.5 billion during the quarter, a 2.4% increase from the same quarter a year earlier. Shares were down by about 3% in early afternoon trading. The results come in the midst of a company housekeeping effort, in which the Bentonville, Arkansas-based giant is trying to make its shopping experience more pleasant and efficient for consumers. Globally, sales in the fourth quarter fell to $128 billion, down from $130 billion the previous year. Net income attributable to Walmart fell about 8% for the quarter to $4.6 billion, as the company has moved to increase employee wages, shutter some stores and renovate others, and invest in its e-commerce operation to better challenge online rival Amazon. Overall e-commerce sales were up over the past year by 12%, accounting for $13.7 billion of total sales.